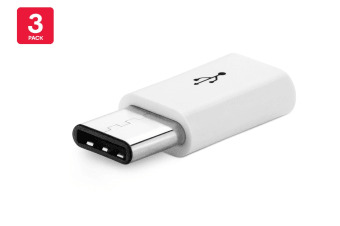 Read customer reviews of the 3 Pack Micro USB to USB-C Adapter. After a purchase, we invite our customers to leave a product review. The customer reviews for 3 Pack Micro USB to USB-C Adapter are below. Products are generally of good quality. the first one I plugged in didn't connect, the second one worked, the third out of the packet was actually bent, but if you wiggle it on the right angle will charge my phone. For the price. Great vaue for money. It was some plastic USB C adapter, quite cheap, good stuff. Works well but a bit fragile. This is the second order for this part. previous unit have broken. The white plastic is not strong enough and come loose. But is works well and is cheep. So cannot complain and cannot be purchased any where else to my knowledge. I guess I will be back to buy more. Typical Chinese quality. I ordered the wrong type. Some don't charge or transfer.